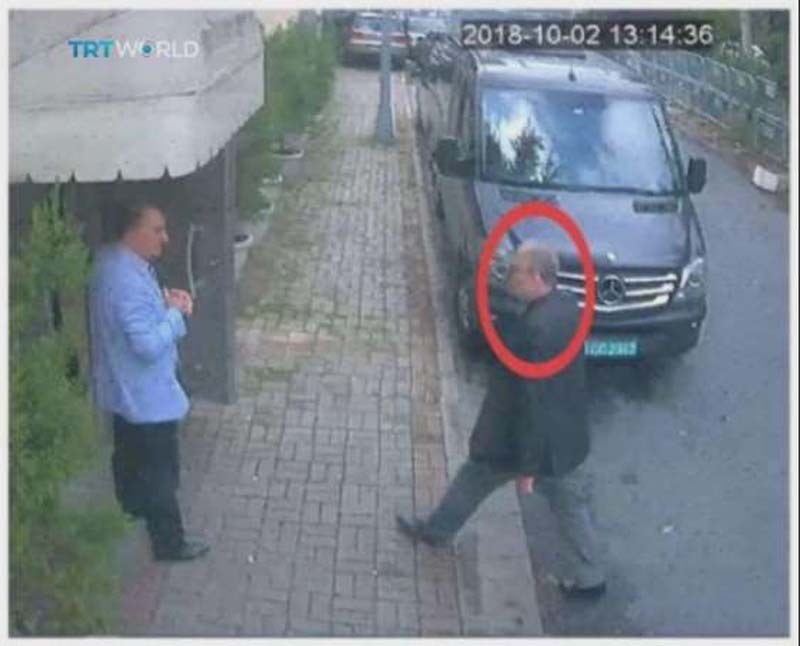 © (CCTV/TRT World via AP) This image taken from CCTV video obtained by the Turkish broadcaster TRT World and made available on Sunday, Oct. 21, 2018, purportedly showing Saudi journalist Jamal Khashoggi entering the Saudi consulate in Istanbul, Tuesday, Oct. 2, 2018. Turkish President Recep Tayyip Erdogan on Sunday vowed to reveal within days the "naked truth" over the death of journalist Jamal Khashoggi, as Riyadh said it did not know the whereabouts of his body and that Crown Prince Mohammed bin Salman had been unaware of any operation to murder him. The Turkish leader's statement came the day after Saudi authorities conceded Khashoggi had been killed inside their diplomatic compound in Istanbul. In his strongest comments to date on the affair, President Donald Trump accused Saudi Arabia of lying about the killing of Khashoggi, a Washington Post columnist who fell out of favour with the ultraconservative kingdom, as pressure built on the US administration to strike a tougher line. The Saudi foreign minister, Adel al-Jubeir, on Sunday described the killing as a "tremendous mistake" and said it had been a "rogue operation" by individuals who "exceeded their responsibilities" and then "tried to cover up for it". Jubeir insisted in an interview with Fox News that the operation was not ordered by the crown prince known by his initials MBS, also adding that "we don't know where the body is". Erdogan, who has not yet directly blamed Saudi Arabia, held a telephone call with Trump on Sunday where the two leaders agreed the Khashoggi case needed to be clarified "in all its aspects," a Turkish presidential source said. Erdogan is expected to make a full statement to his party's MPs in parliament at around 0800 GMT on Tuesday. Turkish officials have said they believe that 15 Saudi men who arrived in Istanbul on two flights on October 2 were connected to Khashoggi's death. Riyadh reacted by claiming one of the 15 had died in a car accident years ago. Saudi officials originally said Khashoggi, who stepped inside the doors of the diplomatic mission on October 2, had left unharmed, before announcing he was killed inside the building in what they described as an altercation. The kingdom has since admitted Khashoggi died in a "brawl" inside the consulate and said it has fired five top officials and arrested 18 others in an investigation into the killing. Khashoggi, who would have been 60 this month, sought refuge in the United States after fleeing his native Saudi Arabia after the 2017 appointment of strongman Mohammed bin Salman as heir to the throne. The journalist, who had espoused both Islamist and liberal views throughout his decades-long career in the press, was engaged to a Turkish woman. His killing has further soured relations between Saudi Arabia and Turkey, already at loggerheads over Qatar, with which Riyadh cut ties in 2017 and to which Ankara has deployed aid and troops. Turkish officials now believe Riyadh carried out a state-sponsored killing and dismembered the body, with pro-government media in Turkey reporting the existence of video and audio evidence to back those claims. As the Turkish leader is expected to reveal all details into the journalist's killing, Trump has stepped back from his stance that Saudi Arabia's latest explanation over the death was credible amid mounting pressure at home. "Obviously there's been deception and there's been lies," he said of the shifting accounts of Khashoggi's death offered by Riyadh. "Their stories are all over the place." Several senior members of Trump's Republican Party said they believed Prince Mohammed, the kingdom's de facto ruler, was linked to the killing, and one called for a "collective" Western response if a link is proved. Trump has stopped far short of calling for the prince to be replaced, emphasising as he has before how important the US-Saudi relationship is to Washington's regional strategic goals. He described the 33-year-old prince as a "strong person; he has very good control." It has also blown up into a major crisis for Prince Mohammed whose image as a modernising Arab reformer has been gravely undermined. Britain, France and Germany have shown a united front, demanding Saudi Arabia clarify how the journalist died inside its Istanbul consulate backed by "credible" facts. Australia, Canada, the UN and the EU have also demanded greater clarity around Khashoggi's death. German Chancellor Angela Merkel added that Berlin would not export arms to Saudi Arabia "in the current situation". Germany last month approved 416 million euros ($480 million) worth of arms exports to Saudi Arabia for 2018. In the past, military exports by Berlin to Saudi have mostly consisted of patrol boats.